The Red Mountain Underground Gold Project (the Project) requires a decision under both provincial and federal environmental assessment legislation. The Project is being assessed under a harmonized process between the BC Environmental Assessment Office (EAO) and the Canadian Environmental Assessment Agency (CEAA). The Project was granted its Environmental Assessment Certificate by the Province of BC on October 5, 2018. A copy of the press release issued by the BC EAO can viewed here. With the provincial environmental assessment now complete and the federal environmental assessment advancing forward to its final stage, IDM anticipates receiving federal approval in late 2018 or early 2019. 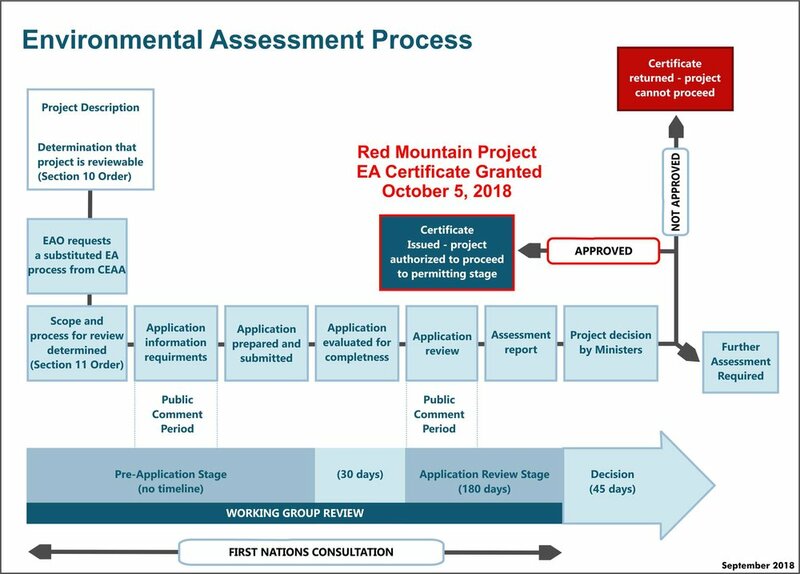 Information pertaining to the Federal Environmental Assessment for the Red Mountain Underground Gold Project can be viewed on the Canadian Environmental Assessment Agencies website at https://www.ceaa-acee.gc.ca/050/evaluations/proj/80093. EAO publishes all environmental assessment information and associated documents, including information on how to get involved in the process, on the Project Information Centre website (e-PIC). All documents relevant to the federal environmental assessment of the Project are available online at CEAA’s Project Registry. The provincial and federal environmental assessment processes are comprehensive and will address all potential effects of the Project on environmental, socio-economic, health, and heritage values and aspects. Conducting an assessment of the Project’s potential economic, social, and cultural effects on Nisga’a citizens.